What do you imagine when someone says the word "lamp"? different styles of lamps for different rooms and purposes. 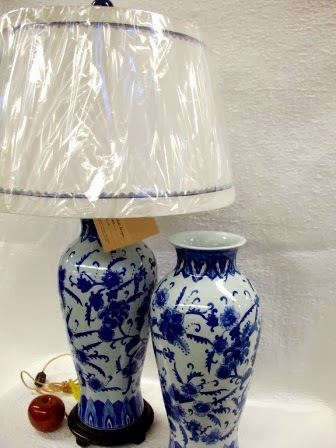 On the right is a blue and white porcelain vase made into a lamp with a wood base and a custom lamp shade trimmed in blue that is perfect for a bedroom. And here is the terrific small lamp for a child's room or for someone who collects tea pots or pigs. This lamp has a pink finial and the linen custom lamp shade is decorated with pink and green beads. 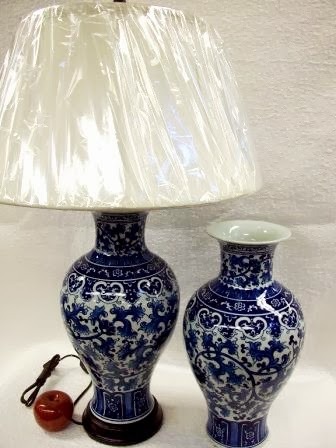 If you love a porcelain figurine but do not like having a "dust catcher" try turning it into a lamp making it functional and lovable at the same time. By changing the lamp base, the finial and custom ordering the lamp shade, there are 1000's of way to create individual lamps to match or compliment your work and home space. Below are examples of Lucite bases; one on a celadon green porcelain plum jar and another on a white phoenix-tail porcelain vase. A terrific carved mahogany wood base is pictured under the ox blood red porcelain double gourd vase while the blue and white porcelain vase has plain wood. Note the custom made flared lamp shade on the charcoal and yellow porcelain lamp and the orange finial on the antique vase porcelain lamp. Feel free to email or call me about creating your own fun or functional porcelain lamps at BlueWhiteVases.com. We can wire any of or your porcelain items to create a one of a kind lamp.